I'm not entirely sure how this tradition started, but every year, my sister and I make a cake for each other on our birthdays. We usually set a very loose brief or show each other pictures of cakes we like, and then we go from there! This year, my sister was really loving the idea of funfetti and that's all she gave me to work with. While funfetti is all well and good, I wanted to try something totally new that's been massively popular on social media, which is the famous drip cake. I had no idea how to go about it, but after 5 hours of work, I think I did a pretty good job! The main reason why this cake took so bloomin' long to make was because it's made up of four layers, making it the biggest cake I've ever made, but because I wanted it to have decent drips, I needed height. Of course, if you felt inspired to try it out, you could use less layers or add more if you were feeling daring, but four was definitely enough for me. To contrast against the vanilla funfetti, I sandwiched a spread of white chocolate buttercream and raspberry jam between each layer. Then I coated the entire of the outside with white chocolate buttercream and it tasted phenomenal. It had that stereotypical kids birthday cake to it and it was just so yummy! Any decorations you'd like - sprinkles, chocolate shavings etc. Preheat your oven to 180c/160c fan/gas mark 4, and grease and line 4 x 20cm cake tins. If you don't have 4, you can bake in batches - so if you have 2 tins, half the recipe, bake the cakes, then move on to the other 2 layers afterwards. This is what I had to do and while it was quite time consuming, it allowed my first two layers to cool completely while the other two baked. In a large bowl, beat 450g of unsalted butter, the golden caster sugar and the vanilla extract until pale and fluffy. Add the eggs gradually, beating between each addition until fully incorporated. If it looks like it's curdling, you can add a tablespoon or two of flour. Sift in the flour and baking powder with a teaspoon of salt, and fold into the cake batter. Pour in the whole milk to loosen the mixture slightly before scattering the sprinkles over the mixture and rippling them through. Divide the mixture between your cake tins and bake for 25-30 minutes or until golden and the sponge springs back slightly when pressed. If you're baking all four at once, swap the tins around in the oven after 15 minutes to ensure that they cook evenly. Meanwhile, you can make the buttercream. In a large bowl, beat 330g of unsalted butter until it is soft. Add in the icing sugar gradually to avoid the dreaded sweet cloud, and beat until the mixture is smooth. This may take a while as you'll be making a lot of buttercream, so be patient! Melt your 450g of white chocolate in a heatproof bowl over a pan of barely simmering water or in the microwave - making sure to check it regularly so that it doesn't burn. Once it has melted, allow it to cool slightly before adding it to the buttercream mixture. Beat it in immediately until the mixture becomes smooth and velvety. If it doesn't have the consistency you want, you can either add milk to loosen it or much icing sugar to thicken it up. Once all your cakes are out of the oven and have completely cooled, you can start to build it up. Add a little buttercream to your cake board or whatever you're using to display your cake, and then stack a layer on top. Spread over a helping of the white chocolate buttercream, followed by a layer of raspberry jam. Sandwich another cake on top and continue until you've stacked the last cake. Now it's time to make the topping! In a jug, measure out you double cream. Add the 100g of white chocolate, and microwave the mixture until the chocolate melts. Be sure to check it regularly and stir each time to avoid burning. Once it has melted, add your food colouring gel a little at a time until you achieve the colour that you want. I wanted a pastel purple, so I didn't need to add too much, but if you want a vivid look, you may have to add a bit more! 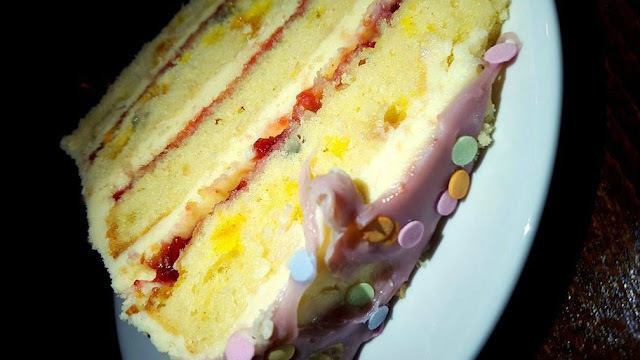 Remove your cake from the fridge and using a teaspoon or a piping bag, add small amounts of your coloured ganache to the edge of your cake where you would like the drips to be. You have as many or as little as you want, but by placing the majority of the drips by hand, it gives you more control over the design. 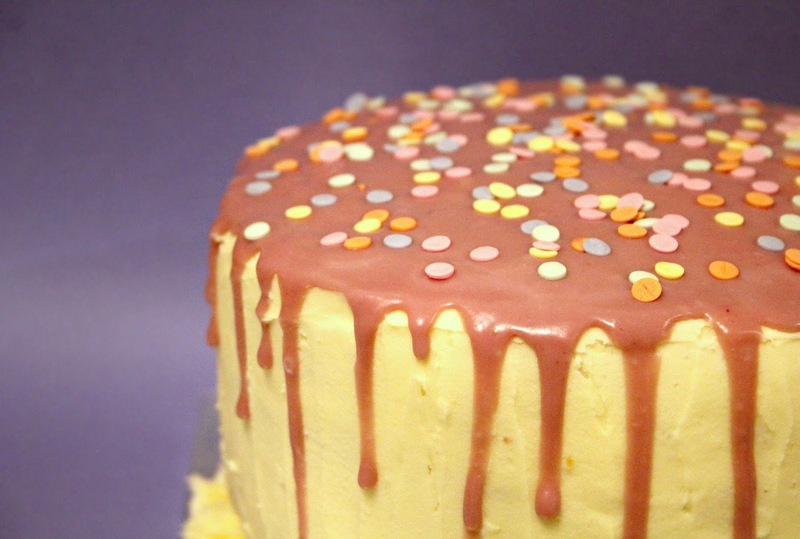 Once you've added all the drips you'd like, you can fill in the top of your cake with the rest of your glaze. You can use as little or as much as you like, just be aware that the more you put on, the more likely it is to run down the sides. Then you can decorate in anyway that you like! I opted for simple confetti sprinkles (which are the same as the ones I used in the funfetti cakes) and I piped some rosettes along the bottom edge of the cake with some leftover buttercream, just to make it look a little more presentable. And this is what the inside looked like! While I was hoping for a little more colour pay off, I was chuffed with how it turned out! And more importantly, my sister loved it, so it was definitely worth the time it took to make. If you've got a celebration coming up, this might just be the perfect kind of cake to make! I'm pretty sure this isn't the last drip cake I make - I'm already scrolling through tons of milk chocolate ones on Pinterest, so watch this space.